Take a step back in time, when Erdnase was alive. The BeeÂ® Squeezers box is an exact reproduction of an early 1900's classic. The BeeÂ® Worm back playing cards inside have been imprinted with an original Scott Kim ambigram that says, "S.W. Erdnase" or "W.E. Sanders" when turned end-for-end. 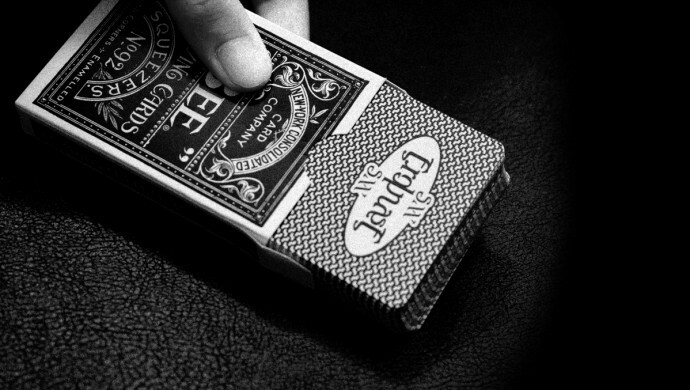 Traditionally cut and printed by the US Playing Card Company on premium paper using their casino quality web press. Distributed in association with the Conjuring Arts Research Centre exclusively for a private gathering. Available to the our fans for a limited time only. Bee® Erdnaseum These cards are offered to the public in commemoration of the enduring mystery of The Expert at the Card Table and its author, S.W. Erdnase. Among the men whose names have been discovered as anagrammatic equivalents (?) to the pseudonymous writer, W.E. Sanders emerges as perhaps the most compelling. A longtime card player and a student of magic, Sanders was the kind of person who took half-a-dozen decks with him on a camping trip. Skilled in deception, he rearranged the letters in his name, tore pages from his diaries and snuck out of his home for late night visits to high-rolling private clubs. A mining engineer and professional writer by trade, Sanders was eccentric and brilliant, offering no justification and seeking no credit for the knowledge he imparted. But whatever the result of his actions may be, if they inspire lovers of card entertainment and legerdemain, then they will have provided the primary motive of card table artifice, as it needs the mystery.